Fishing Hotspot maps are a popular tool to help fishermen catch more fish. Particularly helpful when you want to try a new lake, these maps contain the depth and key underwater features of a lake, as well as places where you are likely to hook into a fish. The map will also contain a list of key features of the lake, such as water clarity, max depth, acreage, and bottom type. 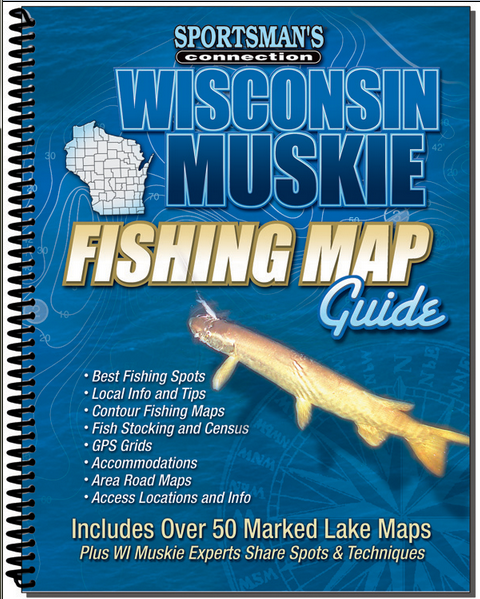 These maps can sometimes be compiled into entire books, so you’ll always have a map of a nearby lake no matter where you are in the state. The table of contents in these books provide an alphabetical list of lakes, so if I want to find the map for Lake Tomahawk, I just look it up in the table of contents, find it’s on page 96, and open the book to that page. But let’s say I want to choose a small lake to fish – I have half a day to fish and I want to cover an entire lake. The only way to find all lakes under 300 acres would be to page through the entire book and check the acreage on each page to see if it is less than 300. Relational Database Management Systems (RDBMS) use indexes to allow queries to quickly find information like this. There are two basic types of indexes in SQL Server – Clustered and NonClustered. Before we get into those, let’s briefly touch on the lack of an index. If there is no clustered index on a table, the table is referred to as a heap. Although data in a heap is usually stored in the order rows are inserted into the table, the Database Engine is free to move the data at will for the purpose of storing the rows efficiently. 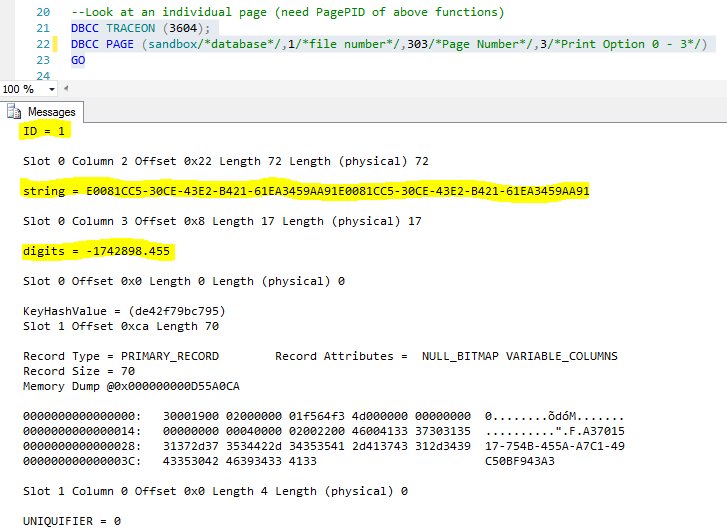 This means INSERTs into a heap are usually fast – SQL Server can just throw the data whereever. However, SELECTs, UPDATEs, and DELETEs are going to be considerably slower because the IO system is going to have to read data from many different places on the disk. There are a few other disadvantages of heaps. One is that the only way to reclaim space is to rebuild the table. If a table is 1 GB in size at its largest, then all the data is deleted out, the size will remain 1 GB until the table is rebuilt. The second is that rebuilding can be a burden, pparticularlywhen nonclustered indexes are involved. We’ll discusses this more later, but nonclustered indexes on a heap contain a pointer between the data that is contained in the index and the remainder of the data for that row, which is stored in the heap. Since rebuilding the table moves the data, the nonclustered index needs to also be rebuilt so the row pointer can be updated to point to the correct location. This is not the case for nonclustered indexes on tables with a clustered index. So the point to take away from this little digression is that there a certain times a heap will be preferable over a clustered index, but in most cases a table will be more performant with a clustered index. There are a few things to note from these results for our discussion. First is the PagePID. 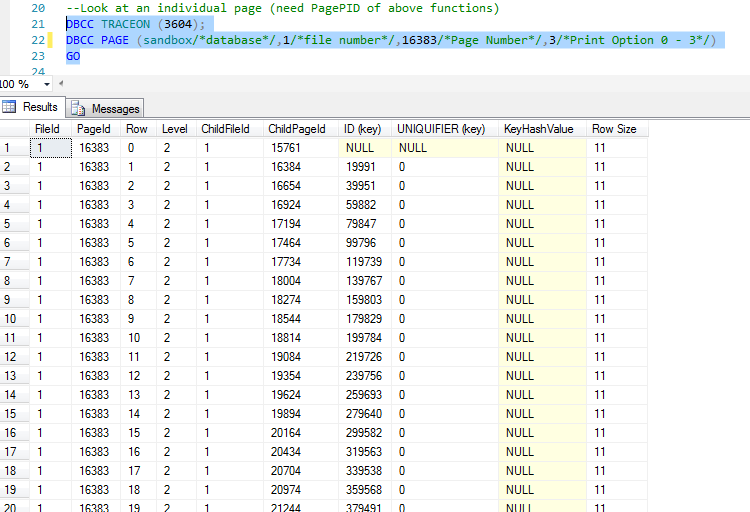 This is the actual pageID within SQL Server. This is unique to the database and represents on 8KB page. Next is the PageType. This shows what is contained on the page. 10 indicates the IAM page, which I will explain in a later blog post. 2 indicates the index page, rather than a data page, which is represented by a 1. The NextPagePID and PrevPagePID indicate the logical ordering of the table. So Page 303 is the first data page in the table, followed by 15762 and so on. So we can see that a clustered index orders the data in the table, and also contains all data for the table in the leaf node of the index. If a clustered index orders the table and contains all the data, why do I need a nonclustered index? Let’s think back to our example of the book of fishing maps. The book has all the data, and the table of contents show where each map is by lake name. But we wanted to find all the lakes that were 300 acres or less, remember? So we create a nonclustered index – that is, a new table of contents to list lake maps by size, starting with the smallest and working our way up. Now we can see the names of all the small lakes together. We’ll still have to flip around the book to see the actual maps, but our new “lake size” table of contents let’s us know which pages to go to. 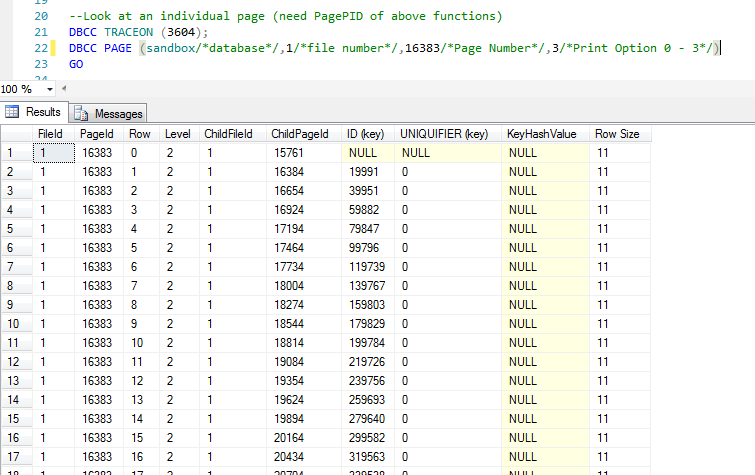 Here the database engine was able to use a index seek on the Nonclustered index. This means it didn’t even have to traverse the entire nonclustered index – it was able to simply find the section of the index needed and read those records. Again, since this points to a physical location, any time that heap data moves (such as during a table rebuild) the nonclustered index will need to be rebuilt. This does not happen during a clustered index rebuild because the nonclustered index only has a pointer to the clustered key. This illustrates the reason for keeping clustered index keys small. Since each nonclustered index contains the clustered index key, a large clustered index key will also force our nonclustered indexes to be larger than may be necessary. 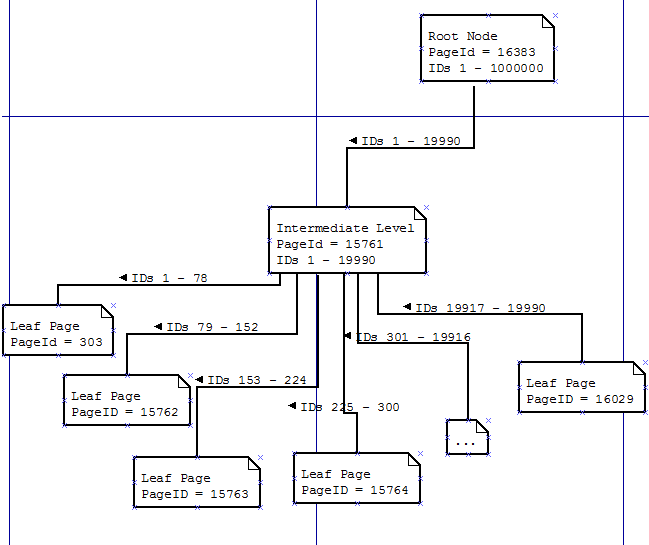 So, there is my (long) explanation of table structures in SQL Server. Hopefully this will help you understand why certain best practices exist, and how to improve performance on your tables.